Property 1: Kleio Home - Close to the beach! Evita's Home, ideal for families & friends with breathtaking sea view! Property 3: Evita's Home, ideal for families & friends with breathtaking sea view! Property 11: Dim Art Stone House. Water front apartment, great sea views, walking distance to the beach & shops! Property 16: Water front apartment, great sea views, walking distance to the beach & shops! Bella Vista, beach house! Right on the Beach, BBQ facilities available! Property 24: Bella Vista, beach house! Right on the Beach, BBQ facilities available! Casa Dorata: Quiet, unique beauty at a picturesque village close to Rethymnon. Property 34: Casa Dorata: Quiet, unique beauty at a picturesque village close to Rethymnon. Rethymno: A wonderful place to stay-Suitable for families. 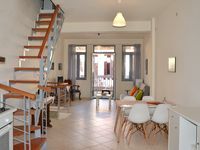 Property 36: Rethymno: A wonderful place to stay-Suitable for families. We arrived to carafe of local wine, fresh fruit, and small sample of local raki. Host was very patient in directing us to location via, phone, text and email as we drove into town. She provided excellent restaurant recommendation. We were able to work off much Greek food and drink negotiating stairs. Great balconies and roof top terrace. Also provided good map of town and region with personal notations of places to see and eat so we could make the most of our 5 days. The location is perfect . You are in old town but on a quiet street. You could walk to everything you could want. We did have a car with us, and the parking is close by. However, you don&rsquo;t need the car to get around town. The flat is beautifully renovated and so very comfortable. It had everything we needed. Our host, Manos, was wonderful. He met us at the car and took us back to the flat to explain everything. He recommended restaurants, which we enjoyed. We couldn&rsquo;t have asked for more other than to stay longer!